Yoga can help you feel great while you are expecting (and beyond). Here are some do's and don'ts to keep in mind.Yoga can help you feel great while you are expecting (and beyond). Here are some do's and don'ts to keep in mind. Perfect for mind and body rejuvenation, yoga uses meditation and aligning movements to encourage fitness and relaxation. This low-impact fitness alternative allows pregnant women to continue an exercise regimen without putting strain on their heart or harming the baby. According to the American Academy of Orthopaedic Surgeons (AAOS), the rewards of basic yoga outweigh the potential physical risks, as long as you take caution and perform the exercises in moderation, according to your individual flexibility level. Executing yoga positions properly is important, especially when pregnant or after giving birth. Maternal stretching and meditation for expecting mothers gives women an option to be comfortable and healthy during their pregnancy. Yoga is an excellent choice for maintaining strength and flexibility, focusing on breathing techniques, and continued relaxation. Pregnant women and yoga-enthusiasts alike also need to practice yoga properly to avoid muscle or joint injury, especially if weight is not distributed properly or the body feels overworked. • According to the U.S. Consumer Product Safety Commission, in 2008, more than 5,500 people were treated in hospital emergency rooms, doctors’ offices, clinics and other medical settings for injuries related to yoga. • Common yoga injuries include straining and overstretching of the neck, shoulders, spine, legs and knees. • Speak to your doctor before participating in yoga or other exercise during pregnancy. Your doctor may advise you to limit your maximum heart rate during activity at this time. • Work with a qualified yoga instructor. Ask about his or her experience and credentials. If you choose to use a yoga DVD at home, look for one that comes highly recommended by your physician or other reliable sources. • Warm up thoroughly before a yoga session–cold muscles, tendons and ligaments are vulnerable to injury. Make sure you cool down as well to relax your muscles and restore your resting heart rate and breathing rhythm. • Wear appropriate clothing that allows for proper movement. Today, maternity yoga pants are readily available. • Beginners should start slowly and learn the basics first, focusing on breathing rather than trying to stretch too far. The purpose of this is to make you and baby feel comfortable, strong, and relaxed, not to "win the race." • If you are unsure of a pose or movement, ask questions. As you enter the third trimester, you will want to focus on poses performed while standing, kneeling, or on your side. Avoid lying on your belly or back, doing backbends, or attempting balance poses on one leg. • Know your limits. Do not try positions beyond your experience or comfort level. • Learn what type of yoga you are performing. There are many different forms of yoga, some more strenuous than others. Most poses can be modified to be safer and more comfortable during pregnancy. It is important to learn which type of yoga will best suit your needs. If pregnant, enrolling in a prenatal yoga class is ideal. If that is not an option, talk to the instructor about your pregnancy and any known "trouble areas" before starting the class. • It is particularly important for pregnant participants to keep hydrated by drinking plenty of fluids. • If pregnant, avoid Bikram or "hot” yoga, which can raise your (and the baby's) body temperature too high. • Listen to your body. 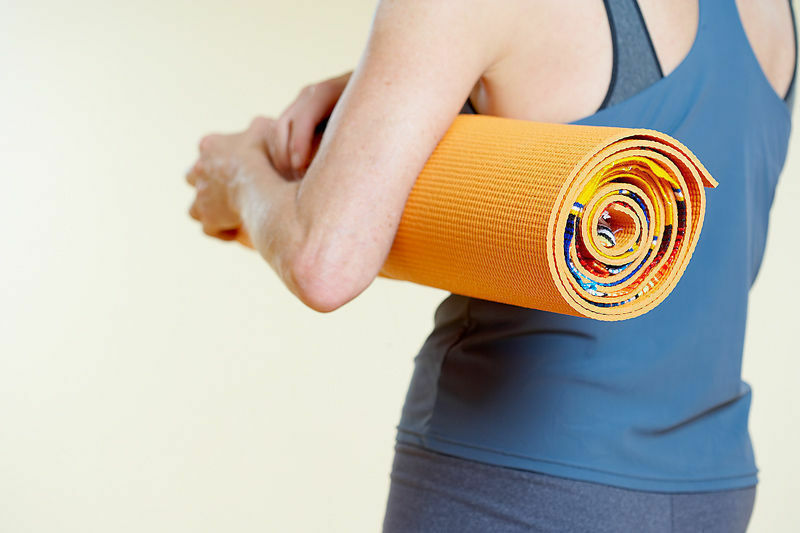 If you experience pain or exhaustion while participating in yoga, stop or take a break. If pain persists, speak with a physician.